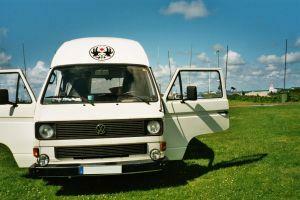 Class B motor homes are sometimes referred to as van conversion campers. They are very popular with couples, small families, and individuals who like to camp in style but don't need a great deal of space. Similar to traditional vans, conversion campers are a little longer and have raised roofs. Unlike other motor homes, these RVs can fit in most standard home garages. They can be the perfect solution for those who want to enjoy camping in comfort, but don't like the idea of towing a travel trailer or operating a large coach. Amenities can vary significantly from one model to another. Many people are surprised to learn just how much room these small RVs really have. Most units can sleep up to four people, and include full kitchens and shower facilities. You'll enjoy luxurious small camper travel in a Great West camper van conversion. Each Great West Van is built on an advanced design European chassis, and operates with a high quality, efficient engine from Mercedes Benz. These vehicles feature independent front suspension paired with rack and pinion steering and four wheel anti-lock brakes. Safety is a key factor in the design and construction of each camper this company produces, but comfort is not overlooked. You'll enjoy the distinct living and sleeping areas, and will be enjoy selecting from the wide variety of available accessories and amenities. Roadtrek makes several different models of camping vans; each provides a comfortable camping environment. This line of campers is designed with safety in mind. Roadtrek campers feature lower centers of gravity and longer wheel bases than many of the other van conversion campers, making them among the most stable camping vehicles available. The aerodynamic styling of this brand of camper allows for exceptional fuel economy, which is boosted by the fact that Roadtrek vehicles are smaller and less heavy than other similar vehicles. A major benefit of class B campers is the fact that they are easy to operate. Driving and parking this type of recreational vehicle isn't very different from handling a full size van or sport utility vehicle (SUV). These vehicles have excellent maneuverability, which gives many people who are nervous about operating motor homes the confidence they need to go RVing. When it comes to fuel efficiency, these types of RVs are a bargain. They are much more fuel efficient than larger motor homes and luxury motor coaches. When you travel in this type of camper, you'll reduce the impact of fuel consumption on the environment as well as on your wallet. There are many additional types of campers in this size range. If you're ready to try your hand at operating and camping in a small motor home, it's time to start shopping around to determine which make and model best meets your needs. If you're interested in purchasing a new unit, it's a good idea to start your search by visiting RV dealers in your area. If you'd rather purchase a previously owned camping van, you might be fortunate enough to find just what you need at a local dealer. It's likely, however, that you'll need to research options for used campers online and through print publications, such as RV Trader magazine. Many people find exactly what they are looking for at PPL Motor Homes , a large Texas based consignment seller for all types of campers. It's also a good idea to let campground owners know that you are in the market for a camper. Many times, camping enthusiasts will post "Camper for Sale" advertisements in campgrounds they frequent or ones located near where they live. Sometimes finding a good deal on a used camper is all about whom you know, and being in the right place at the right time.